What transpired on the floor of the Senate last Wednesday can only shock the uninitiated. On that day, Ovie Omo-Agege, the senator representing Delta Central in the National Assembly, invaded the Senate chambers with thugs. They threw chairs freely, broke legs and then took away the mace, the legislature’s symbol of authority. The scene was cinematographic. It was high drama on stage. The senators were compulsively co-opted into the act. Some ran helter skelter. Others were simply transfixed. None seemed to know the exact role to play. Before they could make sense of the situation, the show petered out. The drama can, in all seriousness, make the shortlist of Hollywood’s most dramatic films for all times. How was the drama crafted? What was it meant to achieve? It all began like this. Senator Omo-Agege had been suspended from the Senate’s plenary for 90 legislative days for allegedly making disparaging remarks about the Senate. He tried his hands on some kind of retraction. But the Senate was not impressed. He was suspended. But the Delta senator would take none of that. He would not play an Ali Ndume, who bore his suspension and degradation with equanimity. Omo-Agege was prepared to fight back. And he did. But he did not go to court to seek legal redress. He opted for self-help. He would ensure that proceedings at Senate chambers were disrupted. That way, he would get attention. But the dramatis personae did not set out to entertain us. The aim was to jolt us, take us out of the usual. That was why there was no finese. It was all a crude display. The whole idea was to subvert order with disorder. To achieve this, Omo-Agege and his collaborators had to go for the jugular. Thugs are not in short supply in his constituency. He had to bring them into the mix. In a show of brigandage and effrontery never known in the history of the Nigerian legislature, the senator and his thugs violently broke into the Senate chambers while the Senate was in session. Ubiquitous security operatives who populate the National Assembly could not screen them out. They made their way unmolested and undetected until they found their way into the chambers. The story is as strange as, if not stranger than, fiction. The thugs operated without let or hindrance. Nobody accosted them inside the Senate chambers. Even when they audaciously took away the mace, no senator tried to stop them. The lawmakers looked on morosely. They were caught off guard or so it seemed. It was unbelievable that the National Assembly could be that porous. From what we saw that day, it is possible for an assassin to enter the Senate chambers and shoot whoever he chooses and leave unmolested. So, why was the Senate helpless in the hands of Omo-Agege? Why was he so audacious? Why did he defy constituted authority by rejecting his suspension and insisting on staying put in the chambers? Some conspiracy theories have since emerged from the scenario. The most potent of them all was that the senator did not act alone. That he was in league with some powerful forces, including security agencies who looked the other way while the brigandage was going on. The overriding sentiment here is that a segment of the federal government is unhappy with the leadership of the National Assembly, whose relationship with the Presidency has been less than cordial. It is also believed by Presidency sympathisers that the high echelon of the legislature has been witch-hunting lawmakers who are loyal to President Muhammadu Buhari and his kitchen cabinet. They, therefore, accuse the National Assembly of arbitrary suspension of its members who are not part of the alleged anti-Presidency disposition. Given this set-up, it is believed in certain quarters that the Presidency may have goaded Omo-Agege on to revolt against the leadership of the National Assembly. 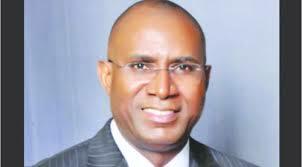 Whatever the situation may be, there is so much to say about Omo-Agege himself. By daring the authorities, regardless of the consequences, the senator has brought our story home. He knows that his action will further dramatise the absurdity in our body politic. He knows that the Theatre of the Absurd, a literary creation of the mid-20th Century, has been domesticated in Nigeria. The absurd theatre is a drama of the unusual. Its advent took the European society by storm with its shocking and unconventional underpinnings. It brought about disquiet and consternation to the social scene. It was a rejection and reversal of what existed before it. What marked the absurd theatre out was its meaninglessness. It reinforced Albert Camus’s existentialist philosophy, which sees human existence as meaningless and absurd. For Camus, man is engaged in an interminable exercise that has no goal. Like Sisyphus, the mythical character created by Camus, whose pursuit of a goal ended in nullity, Nigeria is caught in a cyclical web of nothingness. The meaningless and hopeless state of Sisyphus embodies the spirit and soul of Nigeria. Omo-Agege obviously sees Nigeria through the lenses of absurdity. That explains the drama he enacted. Indeed, the revolting senator understands the Nigerian situation. He knows that his action could cause an outrage. But he also knows that it would not last. It may shock the uninitiated for a day or two. After that, they would come to terms with it. People would fall over themselves trying to dissect the situation. There would be as many positions as there are political divides in the country. After that, the matter would melt into thin air. No one would be interested in the security breach that the senator’s action has brought about. The security agencies would do nothing about the thugs who desecrated the hallowed chambers of the Senate. They would not compel the senator to produce the thugs that he unleashed on the National Assembly. In fact, the senator knows that we are an ad hoc people. We do not have the staying power to see anything through. We are too forgetful. Too unserious with national issues. We just talk about them momentarily and leave them behind even before the dust settles. Naturally, another upheaval would take place and we just move on. The earlier incident would become a footnote in our national discourse. And life goes on. No one really cares. Nobody holds anybody accountable. The revolting senator knows this. And that explains the audaciousness that he has displayed. And true to our projection, events are cascading in quick succession. Gunmen just stormed a Catholic Church in Benue, killing two priests and 17 others. The state has erupted in protest. The people are wailing and mourning. As this was happening, a certain drama was playing out in Abuja. Senator Dino Melaye was in a face-off with the Nigeria Police. He was eventually arrested. We hear he broke his leg and is now hospitalised. These incidents have since diverted our attention. They are the issues of the moment. No one cares a hoot anymore about Omo-Agege and his thugs. That has been consigned to the ash heaps of history. The senator knows this. And he must be having a good laugh.